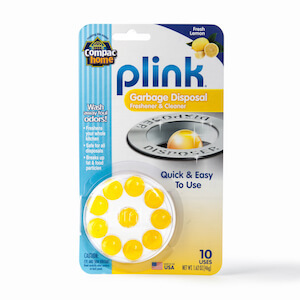 Great for cleaning the toughest jobs around the house, our new Magic-Scrub Dish Wand outcleans the average sponge. 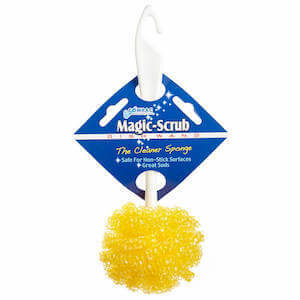 Dish Wand Magic-Scrub is easier to clean than regular sponge wands. Simply rinse out with soap and warm water and your Dish Wand Magic-Scrub is ready to use. 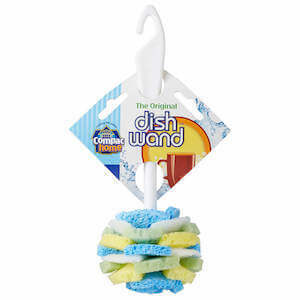 Just add your own dishwashing cleaner to the Dish Wand Magic-Scrubs's scour sponge head and safely reach every corner of your stemware, muffin pans, pots, bottles, etc. The non-abrasive scour is great for cleaning all non-stick cookware, glassware, dishes and other surfaces in the home. No more dish pan hands! A great addition when giving pots, pans, or stemware gifts for bridal showers and weddings.